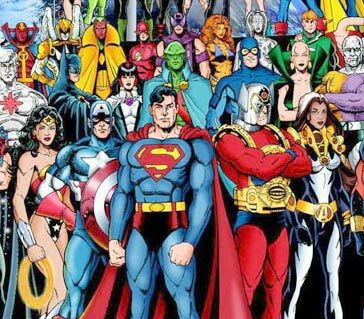 'Cause I would be Awesome Man"
For a list of tropes common to the genre, see Superhero Tropes. A series where the main character has powers and/or abilities that set him aside from other people. Usually (unless he's Not Wearing Tights) he is a costumed do-gooder with a colourful outfit (which likely sports a Chest Insignia), a Secret Identity and often unusual and useful superpowers or equipment. Sometimes he's a loner trying to deal with the hand that fate dealt him. Usually his reason for existence is to defeat his nemesis or arch-enemy the Super Villain. Sometimes the show focuses on a team or other grouping of powered individuals. The original modern Superhero is arguably The Shadow (first published April 1, 1931 in The Shadow Magazine, seven years before Action Comics #1 introduced Superman). Though he did not initially have have super powers other than being a master hypnotist, he gains psychic abilities beginning in 1937 that let him induce psychological invisibility in the radio series (as shown here and here). He was inspired by previous fictional adventurers and crime fighters, such as Zorro. In turn, he has inspired many future superheroes, most notably Batman who was an Expy at first before being differentiated into how he's currently recognized. The first comic strip superhero would have been Mandrake the Magician (June 11, 1934) and the first spandex-type costumed Super Hero is arguably The Phantom (first published Feb. 17, 1936), who wore a skin-tight purple outfit with a mask. Culturally, the concept was crystallized by Superman, who remains possibly doubtlessly the world's most recognized superhero. From there the concept was repeated numerous times, eventually spawning the Justice Society of America which was the first superhero team. Note that not all Super Heroes are super-powered; Batman is often considered a Superhero despite having nothing but training, intelligence, willpower, minor gadgetry and the writers on his side; Phantom was in peak physical fitness, had excellent reflexes and was a sharpshooter. They are generally considered superheroes, partly because of the costume. In trope terms, they go under Costumed Nonsuper Hero. Sooner or later, all Super Heroes have an origin story. If the series lasts long enough, the Sorting Algorithm of Evil will introduce the bigger threat of a Super Villain, possibly an Arch Enemy. If the superhero fights enough of them often enough, they may gather a Rogues Gallery. Superheroes are not limited merely to comic books and their derivations. Greek Heroes like Heracles and Achilles could be considered a sort of ancient prototype. Knight Rider or The Six Million Dollar Man are television examples partaking fairly little of the comic book medium. Anime in particular is chock full of super heroes from Astro Boy to Goku and Sailor Moon. See also Sentai, Magical Girl Warrior. Not to mention Super Robot, which is the Superhero writ very large (and armored). In some continuities they may be called something other than superhero, but they're usually still recognizable as such. See also Superhero Prevalence Stages and Standard Superhero Setting. See also The Cape (trope), Stock Super Powers, Form-Fitting Wardrobe, and of course the Most Common Superpower. The exact opposite would be the Un-Sorcerer. If you feel you have a handle on the elements of a Superhero comic book, hop on over to So You Want To Write A Superhero Comic and see what you can contribute. The Secret Return of Alex Mack, a fanfic for The Secret Life of Alex Mack which tells how Alex went from an unknown "kid with powers" to her world's equivalent to Superman. Spawned a Shared Universe exploring her world, The Teraverse. Drunkard's Walk follows the adventures of a superhero ejected from his home timeline by enemy action as he travels at random through the Multiverse trying to find his way back. The Guardian Project: When comic book superheroes meet ice hockey. Wikipedia has an entire page listing real life super heroes.